Business ManagementCrowdfunding: Can It Work for You? Crowdfunding: Can It Work for You? The proliferation of crowdfunding websites such as Kickstarter and Indiegogo has radically changed how entrepreneurs raise money. Here’s what you need to know. I’ve done a number of profile pieces on members of the archery industry over the years, and one of my favorite parts of doing that type of project is hearing about how an entrepreneur got their start. Many launched their business part-time while still working a full-time job to pay the bills. Others took out small business loans or cashed in their 401ks to fund their new enterprise. Some worked with partners, sharing the risk, while still others acquired existing businesses — and their existing customer base — and then dramatically improved them. In the future, however, I expect I’ll hear more and more entrepreneurs explain that they got their start thanks to crowdfunding. Crowdfunding, which is simply where a large number of people all contribute a small amount of money to back a project or cause, isn’t exactly new. In fact, way back in 1885, The New York World publisher Joseph Pulitizer used crowdfunding to raise money for a pedestal for the Statue of Liberty. Five months later, The World had raised over $100,000 from more than 160,000 donors, with over 75 percent of the donations coming in at less than a dollar. In recent years, crowdfunding sites such as Kickstarter and Indiegogo have helped launch a wide range of products, small businesses, and creative projects. Modern crowdfunding success stories include the Pebble Smartwatch, which raised $10 million from 70,000 in 2012 (in 2015, the third-generation Pebble raised $20 million); the COOLEST Cooler, which brought in $13 million in 2014; and the Sonders eBike, which raised $6 million in 2015. 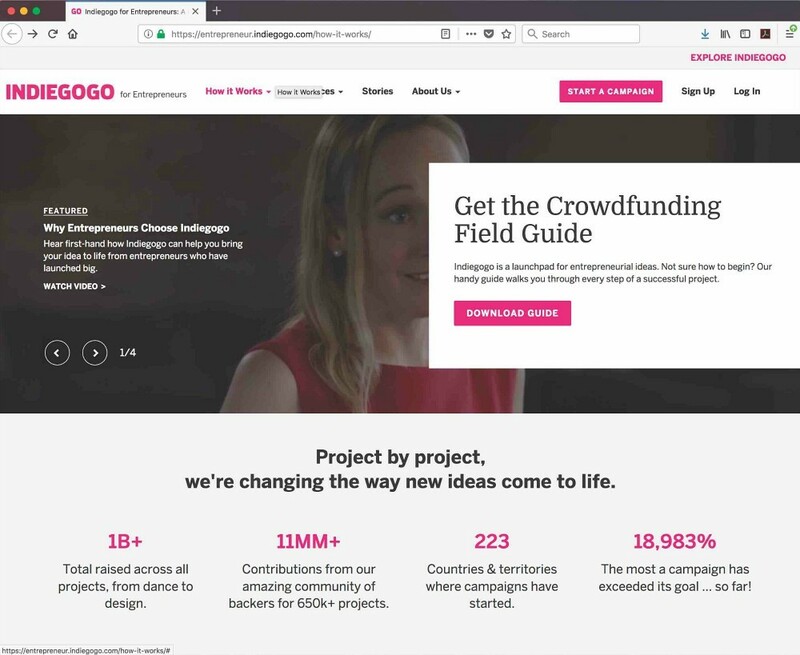 And while many people think of crowdfunding as a way to launch a product or business, in recent years, established businesses have been turning to sites like Kickstarter to help fund renovations, expansions and moves. Over a 30-day period in 2015, 98 people contributed more than $16,000 to help bring the AccuBow, a unique archery training device (left), to market. 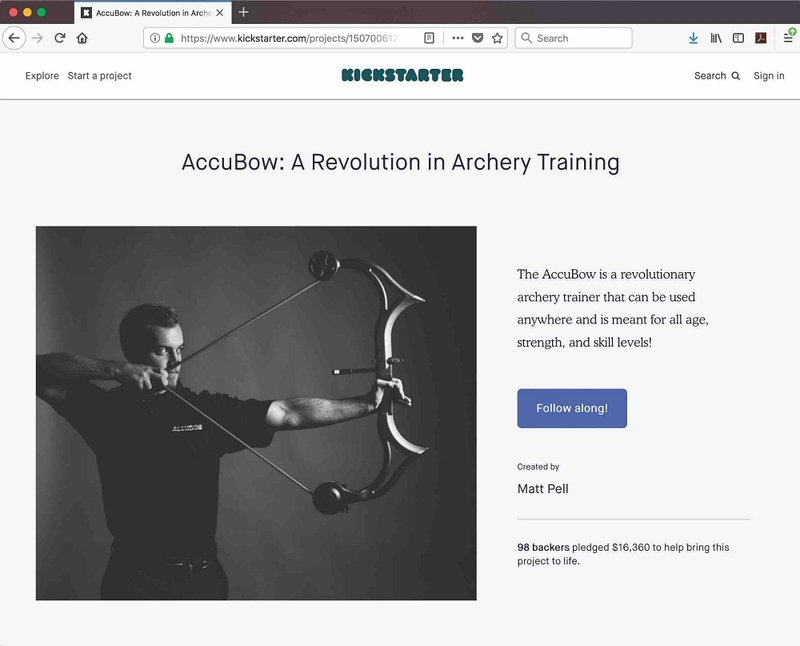 AccuBow Founder Matt Pell chose to use Kickstarter to help him get his business off the ground for several reasons. Obviously, one of the main advantages of Kickstarter is that it allows you to raise money so you can implement an idea without having to fund it entirely on your own. That mitigates risk. But another advantage is that you can get feedback on your idea before you spend a dime on it. Think you have a great product? If you run a campaign on Kickstarter, and people are willing to give you money to produce it, you’re probably right. If the campaign fails, you know you’re doing something wrong. It might be something about the product itself, or it might be the messaging. Either way, you have the chance to go back to the drawing board, all without having to risk your own money first. In addition, putting an idea on a platform like Kickstarter means you have the opportunity to get a lot of eyes on it. If you develop a product that “goes viral” on a crowdfunding site, you’ll get a lot of eyes on it before you even get it to market. You’ll be connected to people who are not only interested in what you’re doing, but are willing to help fund it. Those individuals can be powerful advocates for your project once you launch. Finally, many successful crowdfunding campaigns have come to the attention of larger investors. Good ideas get noticed, and often good things happen when you get noticed. Different crowdfunding platforms have different rules. In general, you set the funding goal and the length of the funding period. While it may seem like a good idea to set a long funding period, remember that you need to maintain a certain energy level throughout the funding period, so don’t go too long. Some crowdfunding platforms, like Kickstarter, are all or nothing. If you set a funding goal of $10,000 and only raise half of that, the donors don’t have to pay any money and you get nothing. You get money only if you reach (or surpass) your goal, which means you need to think carefully about how much you need and what’s realistic to expect of your donors. Other platforms, like Indiegogo, offer flexible funding, which means if you set a goal of $20,000 and only raise $7,500, you’ll get the money you raised despite falling short of your goal. Keep in mind that crowdfunding platforms will take a percentage of the funds you raise, and using the flexible funding option means you’ll pay a larger percentage of the donations to the platform. Credit card processing fees will also come out of your funds. Crowdfunding donors generally expect perks in exchange for their donation. You should develop a range of rewards for donors depending on how much money they give. Pell’s donors received things like hats, T-shirts, stickers and AccuBows at discounted rates. What Can Retailers Do With Crowdfunding? Admittedly, crowdfunding is ideally suited to launching a new product. But that doesn’t mean retailers haven’t found ways to make this new funding method work for them. A 2014 New York Times article took a look at a number of restaurants that used crowdfunding for large moves and renovations. One Minnesota restaurant, Travail Kitchen & Amusements, ran a campaign for $75,000 for a relocation. During the month-long campaign, the restaurant raised $255,000. Some retailers use crowdfunding to branch into new product lines, or to develop their own unique product lines. BicycleRetailer.com profiled Chris Kelly of Topanga Creek Outpost. Kelly began making handcrafted leather goods, such as keychains, wallets and dog collars, to sell in his shop. When he wanted to purchase additional equipment to expand that business, he turned to Kickstarter to raise the money. His campaign did not meet its funding goal, but think of it this way — isn’t it better to gauge your customers’ interest in your project this way than to take out a loan and learn later that the demand isn’t there? Even an unsuccessful campaign can be a win for your business. I asked Pell what he thought was the reason for his success when so many crowdfunding campaigns fail. That may seem obvious, but don’t forget that you need a good story. Most of us are not natural marketers, so be sure to get feedback from other people before you launch your campaign. Keep in mind that one of the reasons why people are willing to give money to an established business is that they want to preserve an important part of their community. This is particularly true of younger people, who see value in supporting small, independent businesses. Certainly, members of all generations participate in crowdfunding, but if you’re an established business, you may want to target Millennials for your campaign. A survey done by the American Dream Composite Index in 2012 backed this up: people aged 24-35 were much more likely to donate money through crowdfunding platforms than people over 45. Once you have a good story, you need to promote it. You can’t just set up a crowdfunding campaign and walk away, and expect to collect six figures at the end of 30 days. You need to put in the work. Yes. That New York Times article highlighted the resistance many businesses encountered when they appealed to their customers for money. Many consumers, particularly older consumers, may be put off by a business essentially asking for donations, and you may find yourself subjected to scrutiny and criticism. Crowdfunding is particularly beneficial for those who lack access to capital. Because of that, many have praised crowdfunding as something of an equalizer for women and minorities. But I think that crowdfunding can also be an equalizer for small businesses competing against much larger businesses, like Amazon and Walmart. If you have a good idea and you sell it well, people will support you. And while you may not have the resources Amazon and Walmart have, that support can allow you to be competitive, all while delivering a product or service your community truly wants. 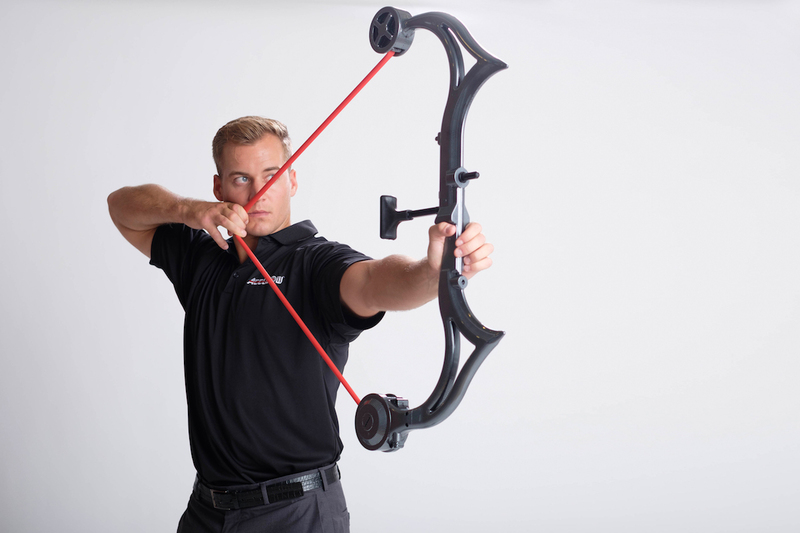 The AccuBow combines a number of features to create a revolutionary archery training device. Designed to improve strength, stamina and accuracy, it offers unparalleled resistance adjustability, and the user can adjust the resistance from 10 to 70 pounds by hand via the unique AccuDial. A built-in laser sight lets you see your stability control and your accuracy as you train at various resistances and your muscles are under stress. Finally, you can dry-fire the AccuBow, which means you can work on your shooting technique and release without having to load an arrow. 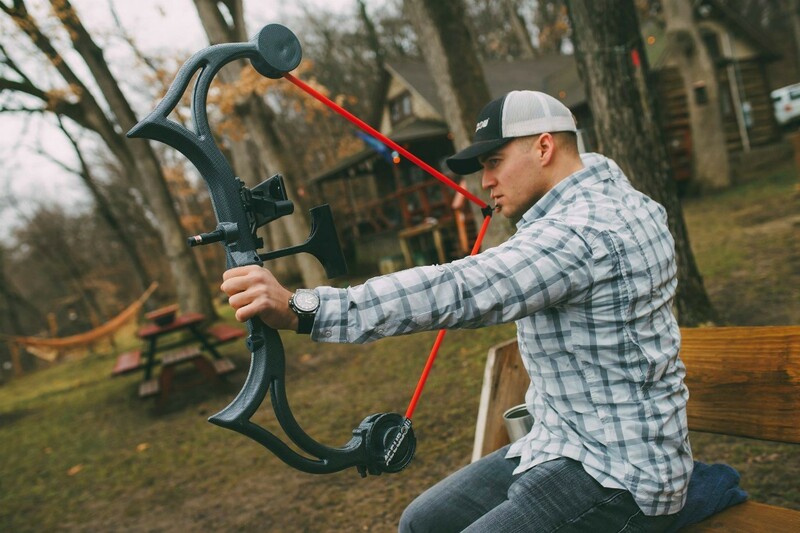 With the AccuBow, you don’t need to be at the range to train — you can train anywhere, anytime. For more information, visit www.accubow.com. Check out the video below showing the AccuBow Virtual Archery Training App.